Tragic death of Isaac Bonshor, reported by the Grantham Journal, December 1918. Funeral of Isaac Bonshor, Bottesford, December 1918. Private Isaac Bonshor's headstone in St Mary's churchyard, Bottesford (Note that his initial has been erroneously inscribed as 'T'). Isaac Bonshor died of influenza in December 1918, a month after the armistice. 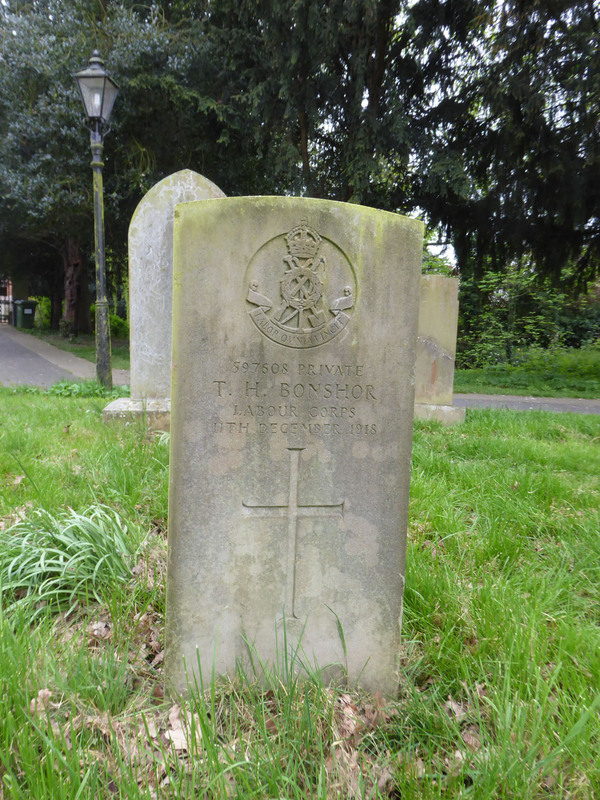 Isaac Henry Bonshor was born in 1888 at Melton Mowbray, the youngest of eight children of George and Martha Bonshor. George Bonshor came from Waltham on the Wolds, where he was born in October 1841. In May 1871, he married 28 years old Martha Yates, from East Leake. In 1881, they were at Sherrard Street, Melton Mowbray, where George was employed as a gardener. There were then five children: Sarah J, (b.1873), Martha (b.1875), William A. (b.1876), Emma (b.1878) and John R. (b.1880). By 1891, they had moved to Village Street, Muston, and George now described himself as a farmer. Young Martha had died, but there were four more children: Mary E. (b.1882), George E. (b.1885), Alice M. (b.1887) and finally Isaac Henry, born in 1888. By 1901, they had moved to Woolsthorpe Lane, Muston, but there were no more additions to the family. George and Martha were the only family members at home in Muston in 1911, and they later moved to Bottesford, living at Ladysmith, Belvoir Road. Isaac Bonshor started school in Muston on the 10th February 1891, and continued his education at Grantham Technical Institute where he headed the list in a special examination in church history in 1904. In 1905, he won a prize for an essay on ‘Progress of the British Empire’, alongside his friend Bernard Ogden from Belvoir, who went on to have a long career in the army. In 1911, Isaac, aged 23, had moved to London to pursue his career as a teacher, and was a boarder at 101, Chestnut Avenue, Forest Gate, Essex. This was the home of Ernest Walker Castle, a “professional messenger”, and his three sisters, Edith Annie, Florence and Elsie, all working as dressmakers. Isaac was now a schoolmaster. At this time, he was registered to vote at his address on Woolsthorpe Rd, Harston, but it is doubtful if he was able to spend much time there. In 1913, Isaac married Edith Castle, on the 24th July, at the Wesleyan Chapel in Poplar, East London. The Grantham Journal (2nd August) reported on the wedding. It added that Isaac had been a student-teacher and assistant master at the Boys Upper School, Grantham, and had progressed to be a schoolmaster with the LCC, working at Trafalgar Square Schools and also lecturing on vocal music at the Council’s Evening Institutions. 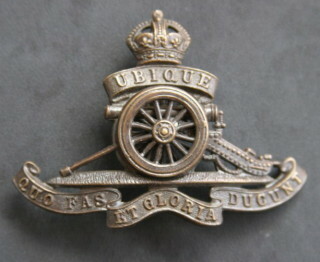 Isaac Henry Bonshor joined up in 1917 as 597608 Private in the Royal Garrison Artillery education section (RGA, Educ.). He transferred to the Labour Corps at the end of the fighting. In 1918, there were two severe influenza epidemics, one in the summer and one in the autumn (October to November). Isaac became seriously ill during the latter, and sadly died at his parents’ home (Ladysmith, Belvoir Rd, Bottesford) of influenza on the 11th December, 1918, exactly a month after the armistice. He was 30 years old. He is buried at St Mary’s, Bottesford, and left his wife and young daughter. In May 1919 his family was paid £6 17s 9d, which included a War Gratuity of £5 15s. The brief obituary in the Grantham Journal described him as ardently devoted to music, with a wide reputation as a trainer and conductor of choirs and musical classes. He had been “classed” for home service, suggesting that he was of delicate health, and for a considerable time did duty with the Garrison Artillery on the East coast, living at 34 Kingswood Road, Goodmayes, Essex. During the months before his death, he had been released for farm work and had been assisting Mr G. Donger at Muston. He had also been conducting the practices of a new operetta to be produced in Bottesford at Christmas, in which he was going to be singing one of the leading roles. Died of influenza one month after the armistice in 1918.